Dr. Ravi Kashyap from the Nuclear Medicine and Diagnostic Imaging Section (NMDI) of the Division of Human Health at the International Atomic Energy Agency (IAEA) has been awarded a Life Achievement Award 2016 by the Indo-American Society of Nuclear Medicine, USA. It was announced at this year’s 63rd Annual Meeting of the Society of Nuclear Medicine in San Diego, USA. 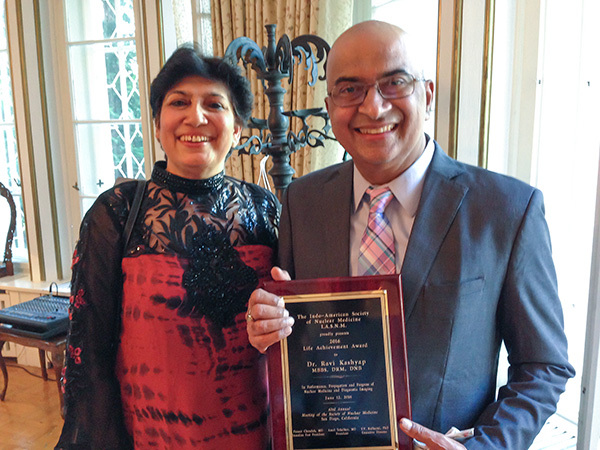 The award honours Dr. Kashyap’s exceptional contribution to the performance, propagation and progress of Nuclear Medicine and Diagnostic Imaging. The award was presented at a ceremony in the Indian Embassy in Vienna on 1 July 2016, organized by HE Mr Rajiva Misra, Resident Representative of the Permanent Mission of India to the IAEA. As a representative of the professional society, Dr. Puneet Chandak, the immediate Past President of the Indo-American Society of Nuclear medicine, also participated at the event. At the ceremony Dr. Kashyap spoke about his work at the IAEA: "I regard work not as a chore, but rather as a passion. My work at the IAEA has allowed me to reach out to many professionals in many countries and support them to provide better care to their patients. Building strong ties with professional societies are at the heart of IAEA’s support to its Member States and this is why I have always pursued collaboration with them". Ravi Kashyap was born 1960 in Delhi, India. He graduated with a medical degree from the University College of Medical Sciences of Delhi University in 1982 and obtained his Diploma in Radiation Medicine in 1985. He further specialized in medical radio diagnosis and nuclear medicine in 1993 and completed his medical education and nuclear medicine specialty studies as Commonwealth Medical Fellow at St. Bartholomew’s Hospital in London from 1995 to 1996. Before joining the IAEA in 2009, he worked at the Institute of Nuclear Medicine and Allied Sciences in Delhi, where he was appointed Director of R&D in 2008 and Head of the Clinical Division. Dr. Kashyap has been working for the Division of Human Health at the IAEA for 7 years, most recently as a Nuclear Radiologist/Diagnostic Radiologist, since the Section widened its scope to cover diagnostic radiology. The wider field of diagnostic imaging is increasingly gaining momentum in the medical field, in consideration of the growth of hybrid imaging, where nuclear medicine instrumentations, such as single photon emission computed tomography (SPECT) and positron emission tomography (PET), are coupled with radiological instrumentation such as computed tomography (CT) and magnetic resonance imaging (MRI). Dr. Kashyap has authored more than 100 scientific publications, covering all aspects of nuclear medicine and radiology practice, most of them in international medical journals.